Fisher House Foundation is best known for their donation of comfort homes built on the grounds of major military and VA medical centers. (Think Ronald McDonald House, but for military.) The Foundation is a unique private-public partnership that supports America’s military and veteran families in their time of need and made to enable families to be close to their loved one during an unexpected illness, disease, injury or treatment. This program recognizes the special sacrifices of our men and women by their dedication in meeting a humanitarian need beyond what is normally provided by the Departments of Defense and Veterans Affairs. Fisher House Foundation also operates the Hero Miles Program, using donated frequent flyer miles to bring family members to the bedside of injured service members. To date, Hero Miles has provided over 24,000 airline tickets to our military and their families. The Foundation also manages a grant program that supports other military charities and scholarship funds for military children, spouses and children of fallen and disabled veterans. 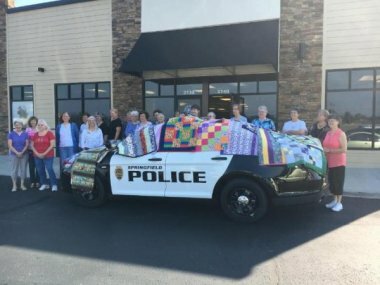 The 2018 Philanthropic project is to put children’s quilts in police vehicles. This was a project our current president, Josephine Keasler headed up in 2013. Some of the Chapters have continued the project (and some have not). There are some areas that definitely need to be resupplied. These quilts are to be given to children that come into contact with law enforcement on an emergency call. They do not stay with the police officer, but with the child, therefore it's an on-going need. Picture courtesy of the Ozark Piecemakers Quilt Guild in Springfield, Missouri. As I was looking for a service project; two needs were brought to my attention. I wanted to find a project where our efforts would be really helpful. I received a letter from Envision Home Health and Hospice requesting quilts for their Hospice patients. I immediately loved this project since I used to be a Hospice Nurse and could see how the gift of a quilt in their last days would be very poignant. They prefer lap size quilts but will take any size. Then I read an article that the homeless shelters really needed bedding. I contacted two places, one in Utah County and one in Salt Lake and they were very grateful for our help. They prefer fleece blankets, any size, since they are light and easily cleaned. Fleece blankets are quick and easy to make. They will accept quilts as well since they often help families in need or runaway teens and others for whom a quilt would be better. Basically, anything you want to make will be accepted.